Movie and Music Surgery | Watch, listen, review. Stars: Lupita Nyong’o, Winston Duke, Elisabeth Moss, Tim Heidecker, Shahadi Wright Joseph, Evan Alex. An everyday family take their annual trip to their holiday home in Santa Cruz but when another family appear in their back yard and begin to terrorize them, their nightmare is just beginning. They come face to face with their doppelgängers and a nationwide event that threatens the life of every American is triggered. The cast is probably the very best thing about Us, all playing two very different versions of themselves. 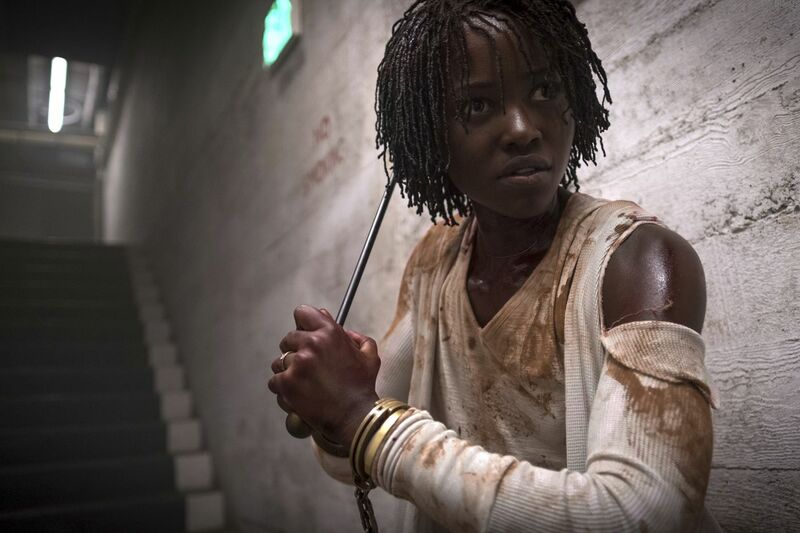 Lupita Nyong’o leads the line very well as the haunted mother of the family, Adelaide, who already has to deal with the demons of her past and a childhood trauma. Nyong’o provides and understandably skittish outlook to Adelaide whilst also bringing a sinister darkness to that of her counterpart, Red. Winston Duke, on the other hand, plays Adelaide’s husband, Gabe, with more comic relief and applies the same to Abraham very well. Both versions are very likeable, despite their very different intentions. Everyone’s favourite handmaid, Elisabeth Moss, enjoys a more withdrawn role as family friend Kitty who, alongside her husband – Josh (Tim Heidecker), is drawn into the nightmare and a similar fate befalls her family. Moss seems to revel in her new-found craziness and although it’s a smaller role she’s no less enjoyable. It’s the kids though that really perform and thankfully show none of the irritating tendencies that seem to plague child characters in films such as this. So, special mentions should be made for both Shahadi Wright Joseph and Evan Alex as their input is no less valuable than anyone else here. As a straight up horror movie, Us performs very well. Naturally, Jordan Peele‘s previous work – Get Out – will be used as a measuring stick but we’re in a different kind of peril here. There’s some good tension and terror but there’s also some straight up slaying and malice. What let the film down for me was that it whilst it started its storyline quite well, it took its time to take its course and when it did it just didn’t sit right. The twists and turns, for the majority of the film, worked quite well but both the path and the delivery of the climax just seemed totally implausible and without any real theatrical shock. Of course, you could argue the whole idea was without realism but you still need to carry a certain logic and plausibility to your plot to totally satisfy your viewer. Verdict 3/5 Stars – Played well but failed to take its chance. Stars: Brie Larson, Samuel L. Jackson, Ben Mendelsohn, Jude Law, Annette Bening. Set in the nineties, Captain Marvel is yet another addition to the cinematic Marvel universe telling the story of Vers (Brie Larson), who was brought up by The Kree and trained in their military forces. Vers, however, has unexplained memories and when she crash lands on Earth during an encounter with The Skrulls, the memories start to unravel and make sense as the battle between the Kree and The Skrulls escalates. She must balance what she learns about herself and use her powers to resolve the conflict. She enlists the help of a much younger Nick Fury (Samuel L. Jackson), embraces the nineties scene and sets about her task. Brie Larson was a very interesting appointment as Captain Marvel and she takes to the role very well. You just can’t help but like her. Larson applies a very cheeky charm to Marvel making it very hard to do anything other than will her on with the mission. The key thing with Nick Fury in this outing was the ‘deaging’ to Samuel L. Jackson and to be very fair, it’s done exceptionally well. In any case it would be unfair to criticize Jackson for any shortcomings or lack of realism with the special effects but let’s be honest, we’re not about to criticize him. This version of Fury is a less battle weary and, dare we say, more naïve incarnation of the character and Jackson certainly has some fun with that in mind. Jude Law weighs in with his usual, almost irritating, swagger as Vers’ mentor and squad leader and it’s a role he’s well suited to. It was good to see Ben Mendelsohn come in to play a different sort of character, to some degree, than he’s been more known for in recent films such as Robin Hood and Rogue One. In support of these leads there’s also some very good work from Gemma Chan as Minn-Erva and things are never dull with Djimon Hounsou around. 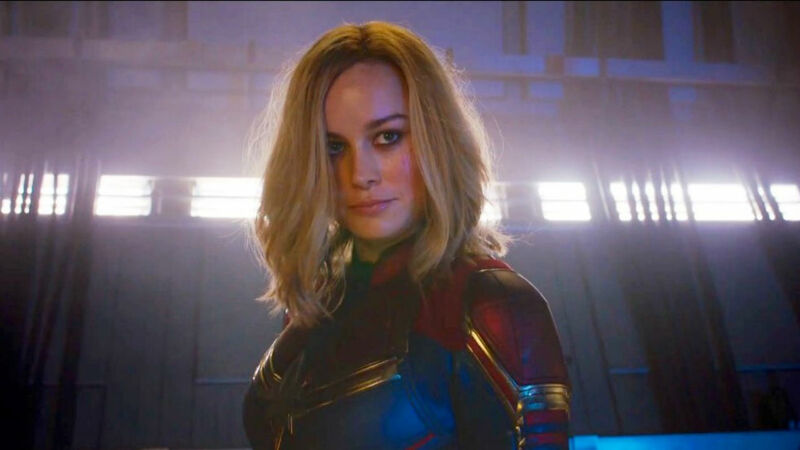 Captain Marvel is a very welcome addition to the Marvel movie franchise. It’s a much lighter affair than the quite dark and tragic events of the more recent events of Civil War or Infinity War, the latter of which events are soon to be resolved this coming April. Back to Captain Marvel, it’s much more of a traditional super hero movie and that of the introductory tale to a new lead hero. It tells of where they came from and how they come to be who they are very well. The film also manages to reintroduce a much missed level of humour to its story, there’s some genuinely very funny moments. It also doesn’t overwhelm the viewer with special effects and they are kept in their place and secondary to the story that is actually being told. Captain Marvel is just what a family super hero movie should be, very entertaining. Stars: Liam Neeson, Laura Dern, Tom Bateman, William Forsythe, Domenick Lombardozzi. Based on a 2014 Norwegian film, ‘In Order of Disappearance’, Cold Pursuit is the tale of Nels Coxman (Liam Neeson) who, after his son is found dead of an apparent heroin overdose, sets about finding out what really happened and exacting revenge (sound familiar?). The only difference here is that our lead character’s main set of skills is ploughing snow from the main roads of the small town of Kehoe – Colorado rather than those he possesses in the Taken movies. It’s now all been all been very well documented about Liam Neeson’s admissions and comments in an interview during the promotion of this movie but how does his performance stand up in the movie? Unfortunately, not very well. It’s a very weak performance from Neeson, it’s almost like as if his Taken character, Bryan Mills, had been on a training course led by Inspector Clouseau. Yes, this character is meant to be an everyman who at the beginning of the film is presented with the Citizen of the year award but Neeson fails to give Nels Coxman that likeable clumsy edge and ultimately does not get the viewer onside. It’s very hard to see why Laura Dern was brought on board and then used for so little, in fact barely any, time on the film. As Coxman’s wife the character disappears early on and without any fanfare. The film’s only real glowing light is Tom Bateman as ‘Viking’ who is a highly strung gangster of which Coxman has set his sights. There’s some welcome input from William Forsythe as Coxman’s brother but again it’s all too sparse. Cold Pursuit starts fairly well but it soon descends into a very tedious loop as the body count increases. The film really doesn’t know what it wants to be and fails to take its own identity. The film is neither black comedy or an actual thriller, it doesn’t even sit comfortably somewhere in between. The attempts at humour frequently fail to land and it’s never in any way tense enough to be considered a thriller. For a revenge yarn, which Neeson is so familiar with, it’s almost like a lethargic John Wick who is just mildly annoyed with a few people. A remake is, arguably, never as good as it’s blueprint but this film does not encourage the viewer to seek out the source material. The Verdict: 2/5 Stars – Cold Pursuit will leave you just that – cold. Stars: Rosa Salazar, Christoph Waltz, Jennifer Connelly, Mahershala Ali, Ed Skrein. Whilst out salvaging for cyborg parts on a scrap heap Dr. Dyson Ido (Christoph Waltz) makes a discovery which leads him to rebuild whom he refers to as Alita (Rosa Salazar), a cyborg with only the brain remaining from her human form. Not remembering anything of her past Alita has to navigate her way through her new world, find her place and recover her identity. This puts her through various tests both physically, mentally and emotionally as she come to terms with her surroundings. Christoph Waltz, Jennifer Connelly and Mahershala Ali can really be summed up in few words. They’re all actors of the highest quality and it’s not unreasonable to suggest that they know they’re just here to supply at least better than competent performances secondary only to that of the visual nature and special effects heavy type of film that Alita is. It’s not to say they are at less than their best but they will earn more merit from a films of very different kinds. They give what’s asked of them with conviction and should be credited accordingly. 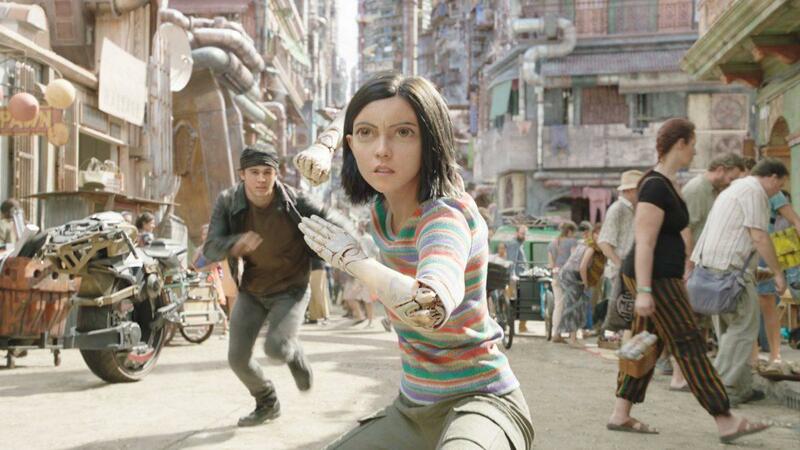 As Alita, Rosa Salazar gives a very likeable sense to her CG character. She has an edge which as her character evolves becomes much tougher and, to some extent, a lot darker. She shows emotion well from despair to elation and manages to take the viewer with her on those emotional swings.